I should never go to a bookstore, because no matter what my original mission was, I invariably end up in the cookbook section. Without fail. I make a stack of all the new ones with beautiful photographs on the cover and find a place to sit where I can look at them page by page, for hours. The world goes away and I am transported to heaven. 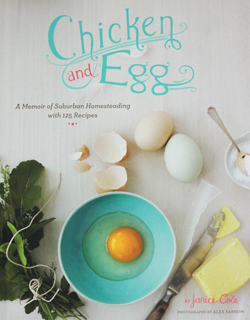 Chicken and Egg by Janice Cole is one of those books with the beautiful cover, but it isn’t just a cookbook with 125 recipes. She tells the story of her first year with three little peeps who grow up. I started reading it and became fascinated. She says chickens give you pleasure and entertainment. They are highly intelligent and each has a distinctive personality. They love human companionship and will cuddle on your lap, beg to be petted, jump on your shoulder and follow you around. They will cheer you up or offer a shoulder to cry on. She originally got them so she could have fresh eggs and ended up in a whole new world. I couldn’t finish reading the whole book in the book store, so I had to buy it. This recipe for the Baked Eggs had a mouthwatering photo that I bookmarked right in the book store. The first time I cooked it, I didn’t have goat cheese, so I used Queso Fresco that I had on hand. It was good, but the second time I made it I used goat cheese and it was outstanding. The ingredients for the Basil-Mint Pesto were small enough that when I tried to make it in my mini processor, it just threw the leaves on the side of the bowl in two seconds. So I ended up transferring the pesto to one of my mortar and pestle, and finishing it that way. Also, it only made enough for two servings, so in the recipe below I have doubled the original pesto ingredient amounts. It is a good herb sauce, so if there is any left over I’m sure you can find a use for it. There is something so eye catching about a yellow egg yolk. It’s rounded, it’s shiny, it has that brilliant yellow-gold color. It may be solid or runny. Who isn’t fascinated by the picture of egg yolk running languidly out of the cut egg and onto whatever it sits upon. You can taste it, can’t you? And do you ever think about where eggs come from? I didn’t until I read this book. If you would like to see some photos from a food blogger who keeps chickens, check out Rustic Garden Bistro. Kim brought home her teeny peeps in June 2011 and has kept a photo journal you may want to check out. They were sooo cute. 1. Preheat oven to 350 degrees F. Butter liberally four 5-by-1-inch gratin or crème brulee dishes and place on a rimmed sheet pan. 2. 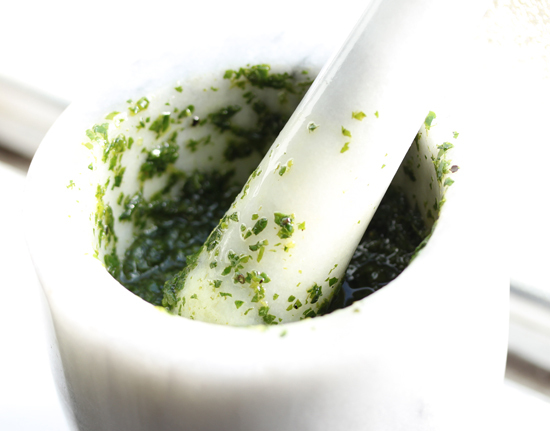 In a mini processor, puree the basil and mint with the garlic, salt, pepper and olive oil. If necessary, add additional olive oil by teaspoons to reach desired consistency. 3. Toast the bread slices and spread each with about 1 tablespoon goat cheese. Make a slight well in the center and a small mound of cheese along each edge, which will keep the egg yolk from sliding off the toast. 4. 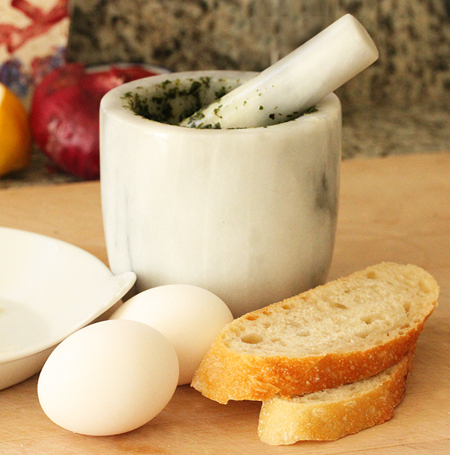 Spread about ½ teaspoon Basil-Mint Pesto per side on the cheese on each side of the yolk well. 5. Separate the eggs, one at a time, with the egg white going into a small bowl, and the yolk in half of the egg shell. Slide the yolk out of the shell into one well on a bread slice, being careful not to break it. Pour the egg white around the outside of the bread slice. Repeat for remaining eggs. 6. Dust with salt and pepper to taste. Sprinkle about 1 tablespoon chopped pecans over each dish. 7. Bake the eggs for 12 to 16 minutes or until the egg whites are set and the yolks are done to your taste. Remove from oven and freshen the pesto on the cheese with a little oil from the remaining pesto. Serve immediately. Pass the remaining Basil-Mint Pesto separately. Note: The basil-mint mixture can be made 1 day ahead and refrigerated, or frozen for up to 6 months. The bread can be toasted and spread with the cheese and pesto up to 2 hours ahead. Hold in a container covered securely with plastic wrap. I wish I could have chickens… bees… maybe my own pig, definitely a turkey. I do have oregano that grows like a weed. What a fantastic egg in a basket dish! You can bet this will be Sunday’s brunch this weekend! I have the fresh basil and mint and it needs to be picked before the first freeze so what a great way to use it! Ingenious! 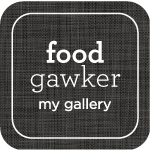 Really nice recipe, and great photos. I sometimes have the same problem with food processors when making Pesto – too much food processor capacity, not enough ingredients. But as you say, you can always find uses for leftover Pesto, so like you I usually make more than I need. Excellent post – thanks. This dish looks gorgeous! I can’t believe I’ve never tried baked eggs. I love eggs. I am going to have to change that and give this recipe a try. I know exactly what you are talking about! I can not go into a book store and not walk out with a cookbook. It is bad! I have a huge bookshelf full of books and need to give some away to make more room for the inevitable. And on that note, I do have this cookbook and I love it. Every recipe is so delicious. I haven’t tried this one yet though. I’ll have to do it. Lynne – I was about to tell you that you inspired me to make my own version this weekend! But then… you already know that. It was so nice of you to come all the way down to Tustin on Saturday night. Thank you!! Your photos are way better than mine – I’ve decided that the skiylight gives really “blue” light because it reflects the sky. Don’t know what to do about that… but I didn’t like my baked egg photo at all. P.S. I too, should NEVER go to a bookstore. I collect them like they’re playing cards… Maybe we should do a cookbook exchange sometime? 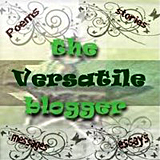 I lend you something I think you’ll enjoy, and vice versa?! Maybe it’d be a good way to get even MORE variety… without gouging the pocketbook. I loved this story Lynne and we definitely share that “bookstore” trait in common! 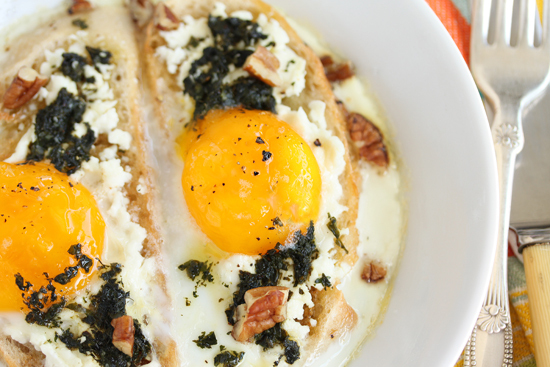 This egg dish sounds fabulous and I can see why it caught your eye! 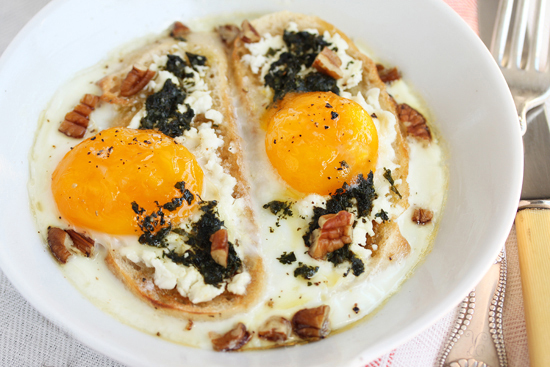 I am bookmarking it since I am always looking for egg dishes I can make in the oven!! can I make this in a large baking dish?- I am making breakfast for 14 people and would like to do it in one shot.